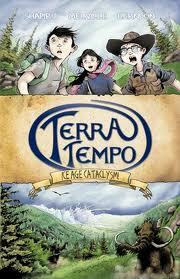 Terra Tempo: Ice Age Cataclysm!, by David Shapiro (illustrated by Christopher Herndon with color by Erica Melville; Craigmore Creations, 2010) is a time travel graphic novel in which three kids use a magical map to travel back to the end of the Ice Age in North America, just in time to watch Glacial Lake Missoula break through its ice dam. It's essentially a science lesson nestled within an adventure story--the intent of the book is to instruct, and indeed it's a clearly presented look at a fascinating moment in time. Twins Jenna and Caleb find the great uncle's mysterious travel journal that seems to contain instructions for time travel, along with a map showing the Missoula flood. Along with a third kid, Ari (keenly interested in Ice Age fauna), they follow the directions....and they work. Now the kids must keep from being eaten by the local fauna, with the help of a friendly Thunderbird, who flies them over the landscape, giving them a chance to see the lake, and its flood, from a wonderfully unique perspective. The illustrations are lovely, and engrossing; the adventures of the kids somewhat less so. However, because the story is punctuated with didactic intrusions, it doesn't flow all that smoothly as fiction. I don't mind learning through fiction, but the balance felt a bit off to me here...It didn't help that the great uncle's journal contained important bits of information conveyed in forced rhyme. At one point, toward the end, the kids see a village from the air, right in the path of the flood, and I was hopeful that some honest to goodness Story would happen (as opposed to sight-seeing and occasionally menacing fauna), but nothing more comes of it. Sort answer--this would be an invaluable tool to use in introducing kids to the end of the Ice Age. It is beautifully illustrated, and the subject is interesting. But it's not one to necessarily offer your kid who loves graphic novels for their stories. That being said, this one might not have worked that well for my particular family because we have watched Mystery of the Megaflood a gazillion times because that's the sort of kid my oldest is...so I think I'll get hold of the second book, The Four Corners of Time. We know a lot less about the Cretaceous Period on the Colorado Plateau, and the good thing about visually appealing graphic novels like this is that they will be read by the aforementioned picky reader kid, even if they are not passionately loved. The art does look nice. I'm going to check this one out. My expectations will be realistic, thanks to your review.